Three "explosions" heard in the early hours of the morning in Northampton are being treated as unexplained. Northamptonshire Fire Service investigated the separate reports in St Mary's Street, Castle Street and Silver Street but "didn't find anything". 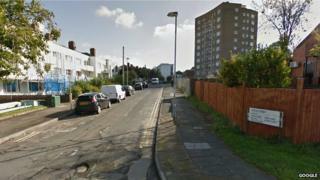 Andy Gineikis, who lives nearby, said he heard a "loud bang" similar to a shotgun blast at about 03:30 BST. Western Power Distribution said there had been a power cut in the Abington area of Northampton at about 04:40. A spokesperson said it was possible that it could have produced a bang but the cause of the power cut was as yet unknown. About 900 houses lost their power but the spokesperson said all of the connections were restored by 05:20. The fire service said the first "explosion" was reported at 02:59 in St Mary's Street, followed by a call from Castle Street at 03:34 and Silver Street at 05:19. The roads are all close to each other. Mr Gineikis said: "I was awake and heard a loud bang at 03:30. "I noticed when I got up this morning that all my digital timers were flashing which usually happens if we have a power interruption." Northamptonshire Police said the bangs were a "bit of a mystery". Officers attended Gladstone Road at about 03:00 to investigate reports of a "loud noise". They discovered a bonfire still alight in a garden and spoke with residents. At 03:40 a bang was reported in College Street. Officers believed it was possibly a "large firework". A final call was received at 05:20 from the Stanley Road area but nothing untoward was found.